Do I need to be with someone on Valentine's Day? The holiday of Valentine’s Day can pressure a lot of people to want to share your company with another, but you really don't have to feel that way this holiday. Being with someone on this holiday isn’t as important as your happiness, and being alone isn’t the worst as well. It may make you ache in sadness, but remember that you always have your peers and family, and others who care about you to spend the time of V-day with. Although, being with someone romantically on Valentine's day sounds amazing, think about your personal state of happiness first. You are your own individual, and letting this holiday’s ideas of being with someone make you feel down is just wasting and killing your happy state. You are just falling victim to this peer-pressuring holiday. However, this holiday represents love. You are love! Everything you are made of and everything that you feel ultimately passionate about are what makes you love. Don’t let your light be directed into the dark by the holidays. Spend this Valentine's Day loving who you are; Spend it caring and adoring those that care about you. You don’t always need to be with someone romantically; the holiday represents your happiness, and the love you hold as a person is an amazing thing. Enjoy who you are during this loving holiday. I’ve never had trouble in school, so I don’t have any study habits. This year though, I started Pre-Calc, and I’ve started to fail. This has never happened to me before, so I don’t know what to do. Help! Oh, have I been there. I’ve broken down some of the biggest things I’ve learned over the last four years here - hope this helps! If you’re anything like me, asking questions in class can seem terrifying. We’ve all heard teachers repeat that same “if you have the question, at least five others probably have the same one”, and while that’s true, asking in front of the class can still make you terribly nervous, and that’s okay. If that’s the case, always try coming in later to talk to the teacher one-on-one. It’s much more personalized, and I think you’ll find that it’s much less intimidating that way. Good times to meet include during ACP, or after school on Tuesday-Thursday (when most teachers don't have after-school meetings). PhotoMath is a free app you can get on your phone to help with solving equations. The way it works is you take a picture of the problem in the app, and it will solve it for you. The real kick to this however is that it doesn’t just solve it, it explains all the steps necessary for solving, so you can remember later on a test or final. PhotoMath only works for algebra and trig level stuff, and it won’t read handwriting, but it can really help you in solving a larger problem if you get stuck somewhere in the middle. There are also plenty of apps out there for all your other subjects, so make sure you’re checking those out while you download this one! Most people tend to try to just open their books and study without any real plan, and while that may work for some, I find the best long-term solution is to schedule your study sessions and give yourself a schedule to stick to. Start with a couple short ones to get into the habit and see if this works for you, perhaps 30 minutes at 4:00, three times a week. It might seem weird to put a set stopping time on it, but really having a goal or ‘finish line’ helps you concentrate longer than working with no end in sight. Once you do this a few times, if you like the method, you can increase or decrease the time as needed. I also think scheduling alleviates a lot of the stress around studying, as you now have a plan to follow instead of trying to improvise solutions as you go. When you’re really having trouble concentrating on something that will take a long time, it might be worth it to try the Pomodoro Method. This is something developed by an Italian grad student in the ‘80s, and has since gained fame around the world. It works like this: Set a timer for 25 minutes, and concentrate on your task for the entire time. If any distractions come into your head, jot them down on a piece of paper for later. When the 25 minutes are up, make a checkmark near your work. Now take a break for 5 minutes, addressing any distractions you wrote down and let your mind rest. After five minutes, repeat the process again, working for 25 minutes, making a checkmark, and breaking for 5 minutes. When you reach four checkmarks, break for 25 minutes. Repeat this cycle as long as you need to get your work finished. It truly works, I swear! The key is to completely take advantage of each break, no work related things allowed! The constant intervals will help refresh your brain and the promise of relaxation keeps your focus. This is something I use when I am down to the wire, freaking out, and need to focus on something heavy or complicated. I did this when studying for the ACT, and quite honestly it saved my life. It goes like this: Clear your space of any clutter or unrelated work, focusing only on the task at hand. Sit up straight, on the floor or in a chair, and find something to rest your eyes on. This could be anything from a crack in the wall to the tip of a pencil, but it should be small, simple, and uninteresting, so as not to distract you from meditating. Slow your breathing. Take long breaths as deep as you can go, let it out smoothly and slowly. Focus your eyes on your object and your ears on the sound of your breath. Let all thoughts drift away, thinking only of inhaling and exhaling. If your mind is distracted by anything, make note of it, and smoothly return your focus to your breath. Don’t be hard on yourself for getting distracted, just concentrate on bringing yourself back into rhythm. Continue for at least two minutes, using a timer if you need one. When the time is up, take that concentration you just developed and apply it to your work. If you again begin to feel agitated later, repeat the process. If you find it very difficult to concentrate without being distracted, try imagining a pattern to follow the sequence of breath. I like to imagine a white light moving in a circle, going down as I exhale and up as I inhale. You can try a flower opening and closing petal by petal, or waves crashing and receding. Whatever you choose, try to keep it simple and relaxing, something that will slow you down rather than speed you up. That’s all I’ve got for now; I hope this can help you out! You probably won’t find that all of these things will work for you, but hopefully I’ve suggested at least one you can use. If you do find one you love, my last advice is to STICK WITH IT. I can’t tell you how many great techniques I’ve discovered only to forget about them a week later and revert to my old habits. Don’t let this happen to you, Student, and stay strong! I like a girl but she has a boyfriend. I told her and she said she felt the same way. She is still with him. What am I going to do? Do I tell her boyfriend? Do I keep it to myself? Please give me your best advice - I don't want to ruin a relationship. 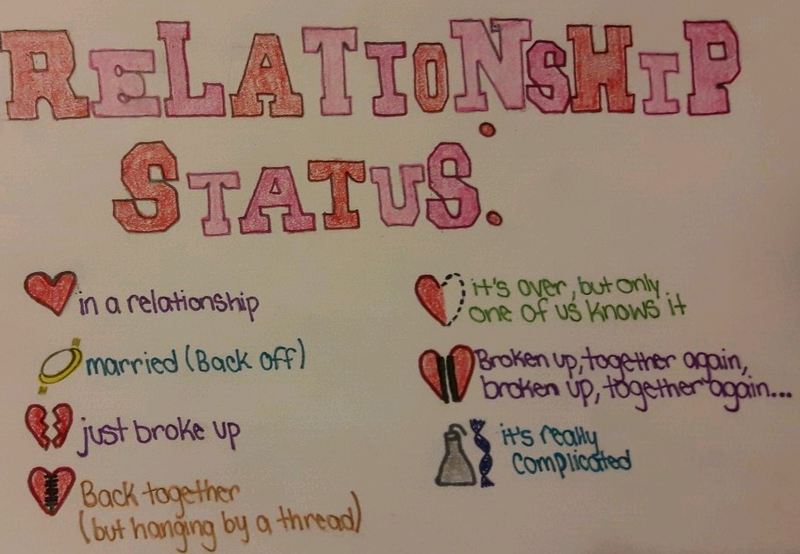 High school relationships, or relationships in general can be complicated. In a situation like this you just need to ask yourself, is getting involved really worth it and would you want a girlfriend that is secretly harboring feelings for another and have her not tell you? The key is to reevaluate your life and think of the inevitables. Either way, someone is bound to get hurt. In my personal opinion, honesty is the best policy. When I was thinking of this dilemma and the straightforward questions you asked, I created a powerpoint of what to do, what not to do and how to think of the situation. Based on my own personal experience and the stories told to me by my friends, there are four recurring guidelines to live by. After reviewing your predicament, the girl seems to be the debating factor.She should be honest and if you two are really serious about one another, then you both should give the news. Being honest is always the best way to go, even if it doesn’t pay off in the beginning. If you love two people at the same time, pick the second one. Because if you really loved the first one, you wouldn’t have fallen for the second. -- Johnny Depp.